Red is a powerful colour. It represents fire and danger but it also connotes energy, strength, love, desire and passion. For this reason, the colour red is emotionally charged and is known to raise the blood pressure, increase the heart rate and even enhance appetite and metabolism. Red is a surprisingly versatile shade that can be used to enhance rooms of all styles. For a contemporary living room, why not embrace the industrial décor trend and incorporate red with a Red Brick wallpaper. 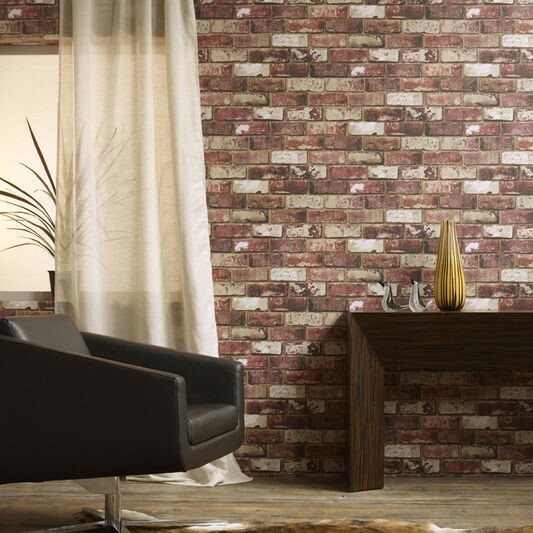 The faux brick effect is still bang on trend and is the ideal way to update your home with the latest designs. Red can also be rich and regal and if you want to update a traditional style living room, our Splendour red and cream wallpaper design is a sure-fire crowd pleaser due to the dramatic damask print. Red can sometimes be overwhelming but you can dilute it with other colours to create a feminine feel. For a vintage aesthetic, look no further than our floral Rome Red wallpaper. Red works well in the bedroom due to its association with love and romance. If you want to create a sensual boudoir feel, our Melody Red wallpaper is perfect. The pearlescent background is truly beautiful and contrasts nicely with the drama of the damask print. 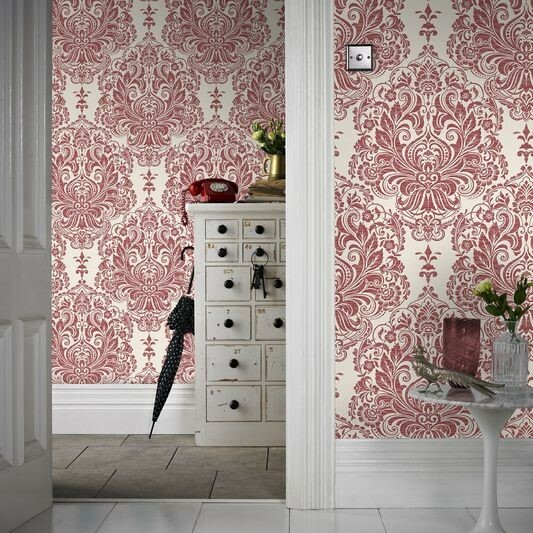 If you want to experiment with texture, our Rhea Red wallpaper is a stunning choice. We love the shimmering metallic detail that adds a certain softness to the overall look. Red is associated with adventure and of course superheroes, so it’s no surprise that red works so well in a child’s room. Our top pick for children’s rooms is the ever-so-popular Superstar Red wallpaper. This fun design provides the perfect backdrop for playtime and will inspire them every day. This bright shade can’t fail to liven up a kid’s room and we know your little ones will love it as much as we do. It is easy to take the safe option with neutrals but opting for a challenging shade such as red can be very rewarding. We hope our top wallpaper picks have inspired you.